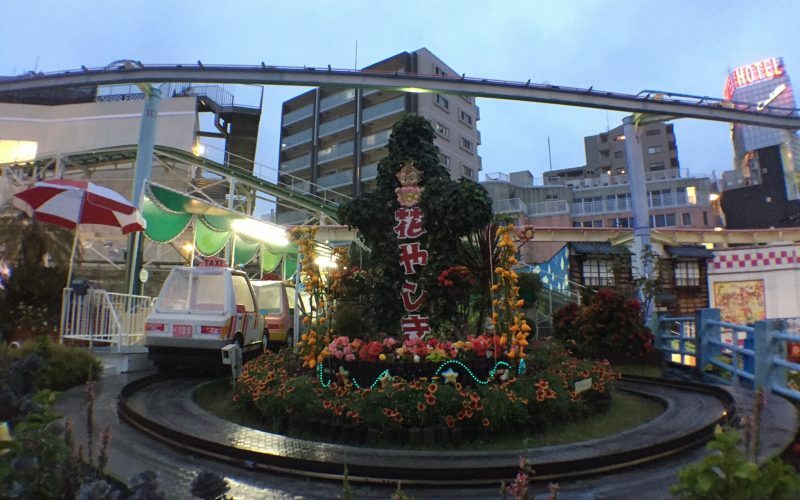 Asakusa Hanayashiki (浅草花やしき) is a small amusement park located in Tokyo. Opened in 1853 at the end of the Edo period, Hanayashiki is the oldest theme park in Japan. 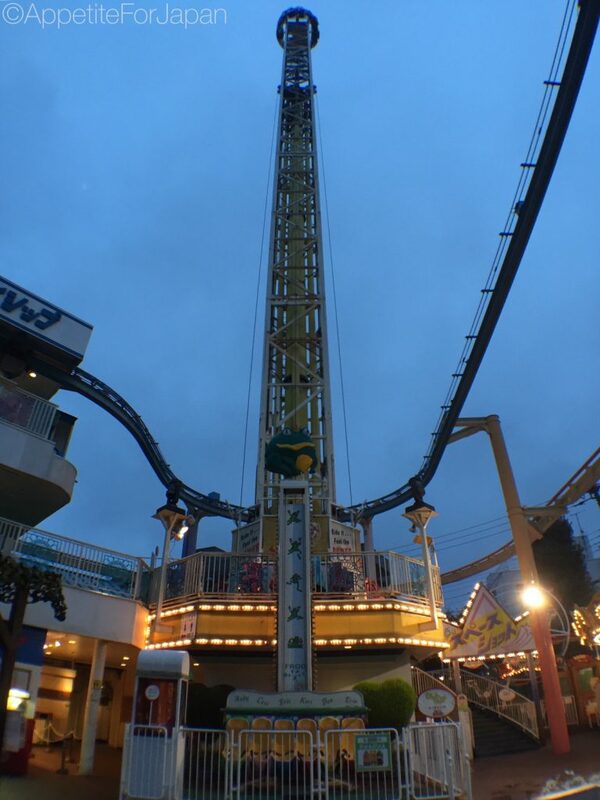 You wouldn’t guess it from visiting the park, but these days Hanayashiki is operated by a subsidiary of Namco, the video game company that also runs the J-World and Namja Town theme parks in Ikebukuro. 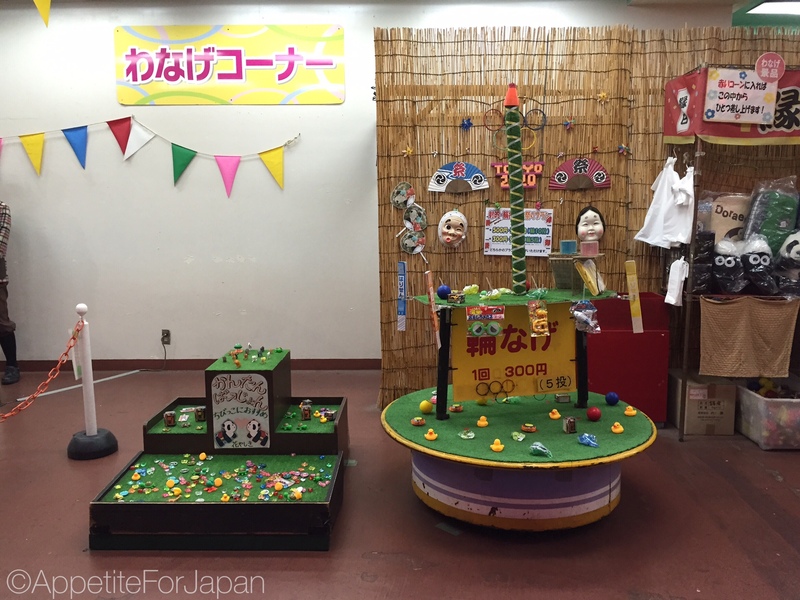 One of Hanayashiki’s main attractions is its Ninja school. It’s a one hour Ninja training course in which they teach swordplay, escape techniques and martial arts. It’s not a serious training course, so you’ll need to have a sense of humour about it. You can find more information here. 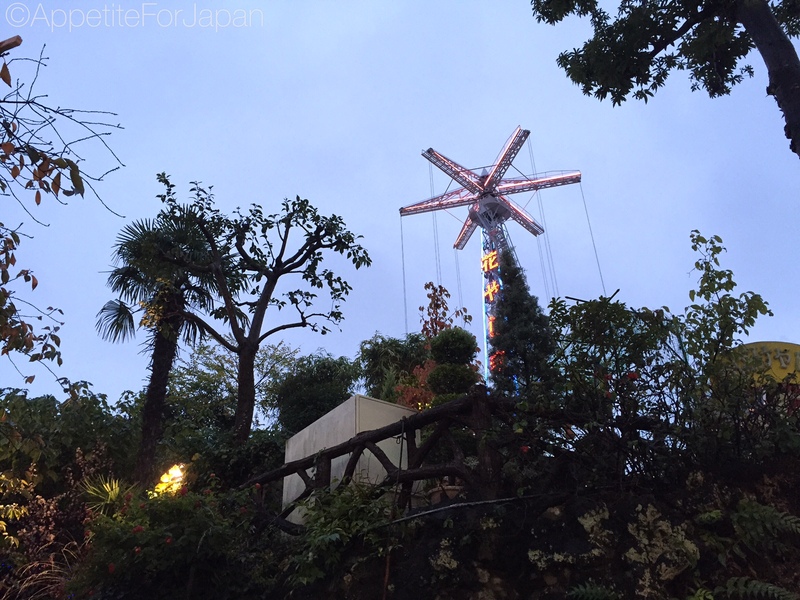 Above: We thought this ride looked rather tame and quaint with its star-shaped cars, until they started spinning! 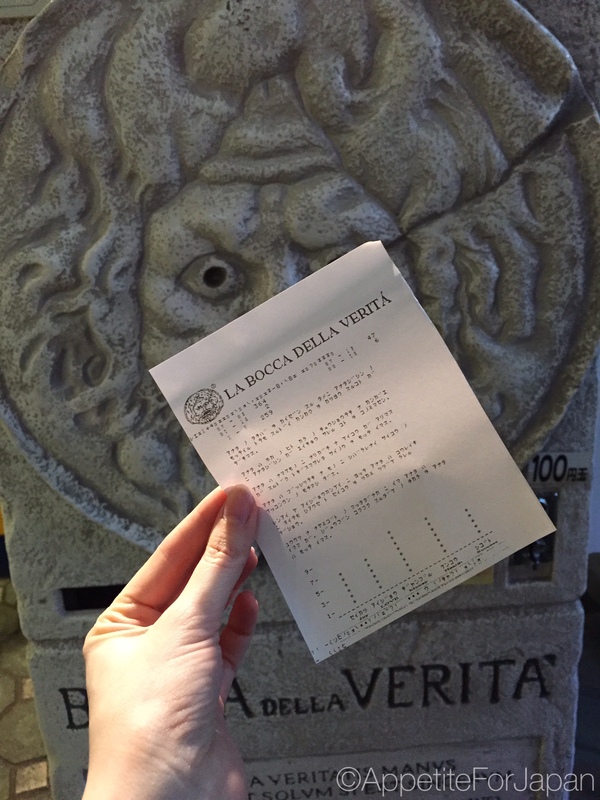 Above: For 100 Yen, I had my fortune read and printed on a little paper ticket from a palm reading machine. It’s mostly in Japanese, but there is English at the bottom of the graph. 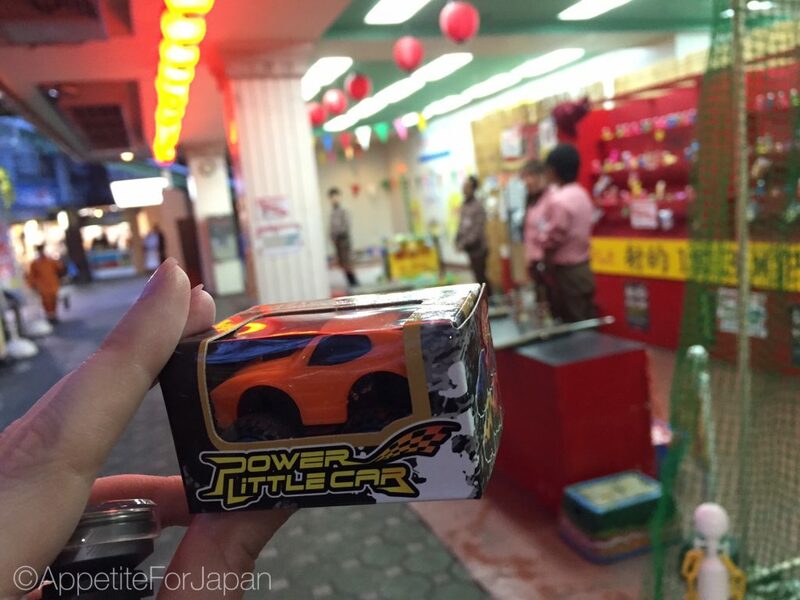 Apparently I’m set to make a lot of money, but if I don’t, it only cost me 100 Yen for this bit of kitschy fun. Above: A small theatre sometimes hosts performances. Nothing was on when we visited, and due to the gloomy, drizzly weather, the park was all but abandoned (I felt that this made it extra interesting). 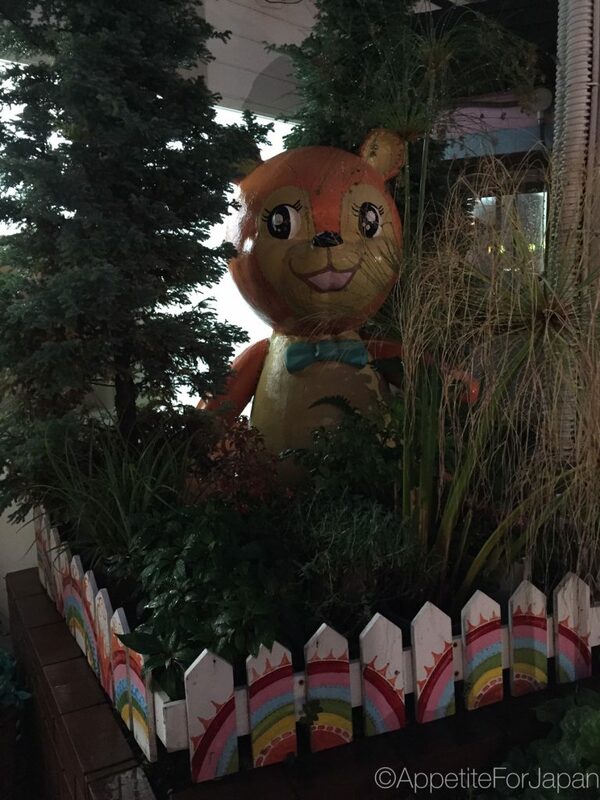 Hanayashiki’s mascot is a panda. We saw a few of these large furry pandas which people were using as seats whilst waiting for friends to use the restrooms. 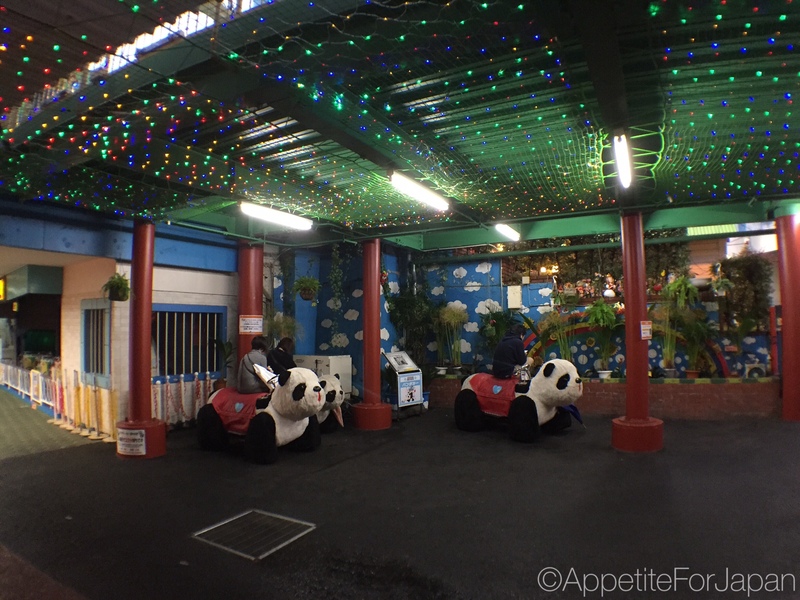 Turns out they’re actually go-carts known as Panda Cars. 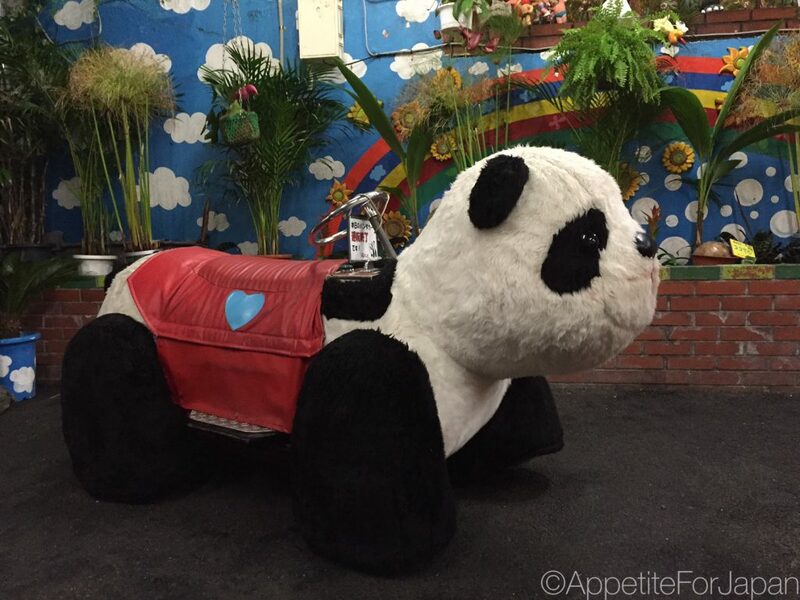 Above: A Panda Car – this is the first time I have ever seen a furry go cart! The term, “only in Japan” comes to mind. 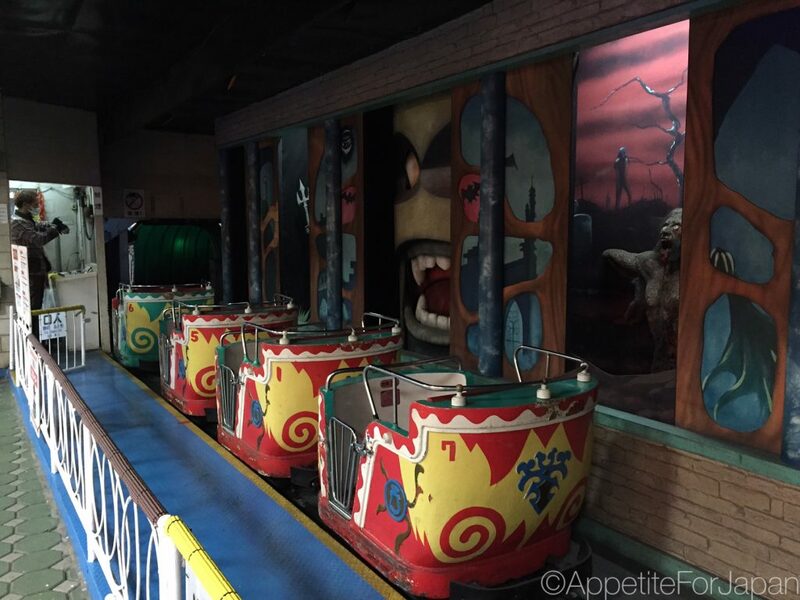 Above: Like any good old fashioned amusement park, there is a ghost train. 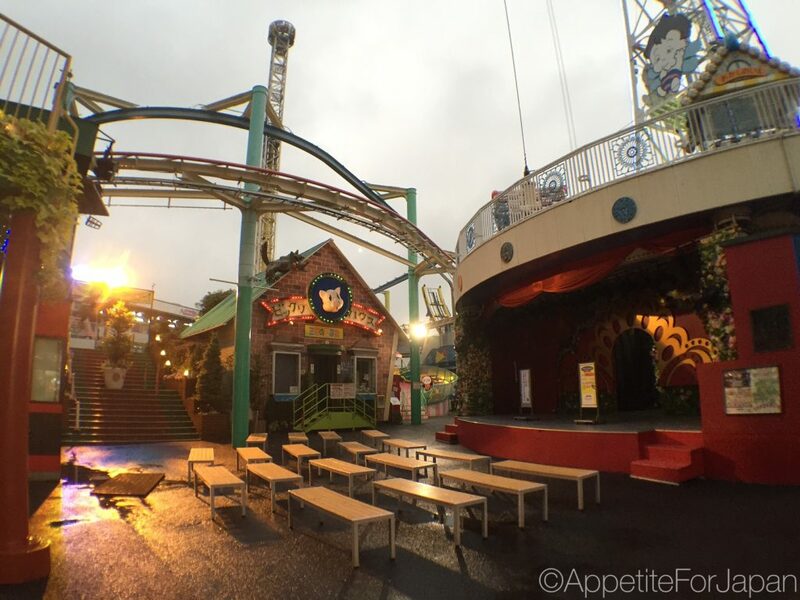 Once you wander further into the park, you’ll start to find things that you won’t find at most other theme parks (along with the furry Panda Cars). 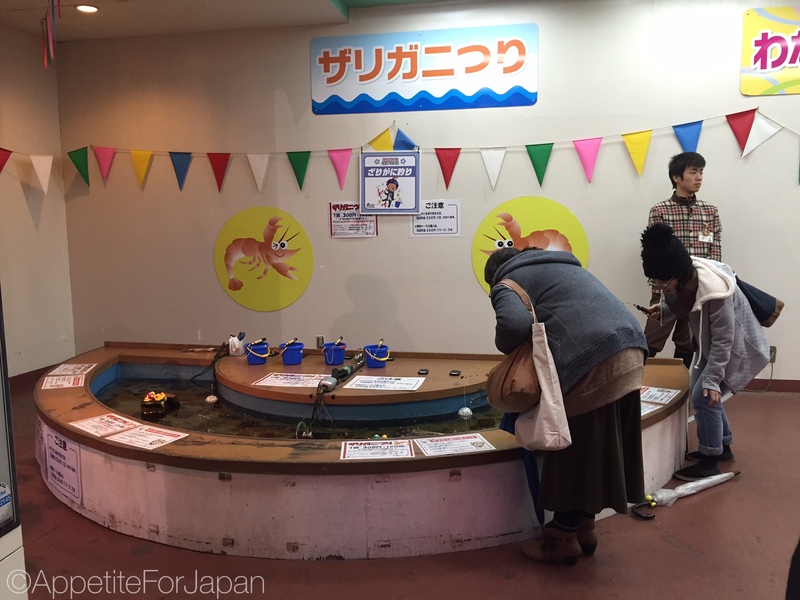 For 300 Yen, you can spend 10 minutes fishing for baby lobsters with a miniature fishing rod. There is no bait, so you have to quickly learn the art of coaxing them to grab two little knots on the end of the rope with their claws so that you can fish them out of the water. 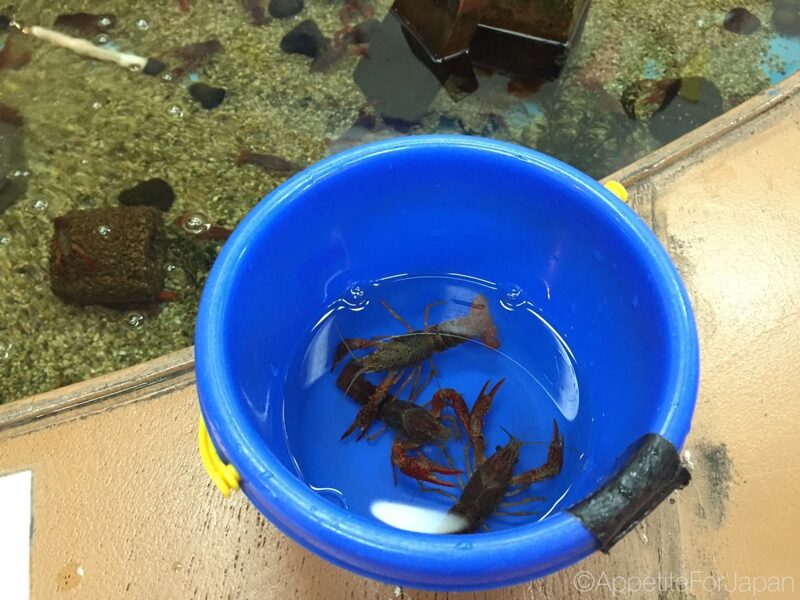 Above: Any baby lobsters that you manage to catch go into a bucket. 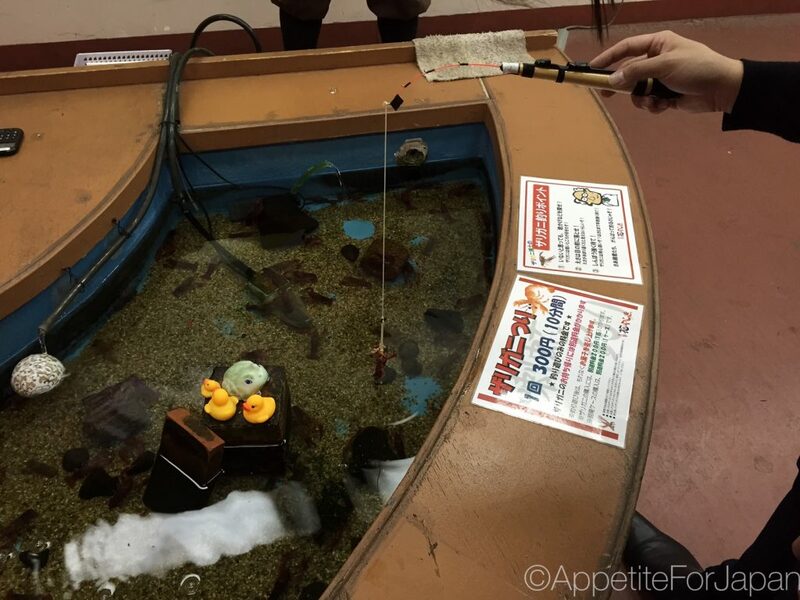 Locals can take them home as pets in a bag (as you might do with a goldfish). For tourists, prizes such a little packets of retro lollies are given instead, and the lobsters poured back into the pond. 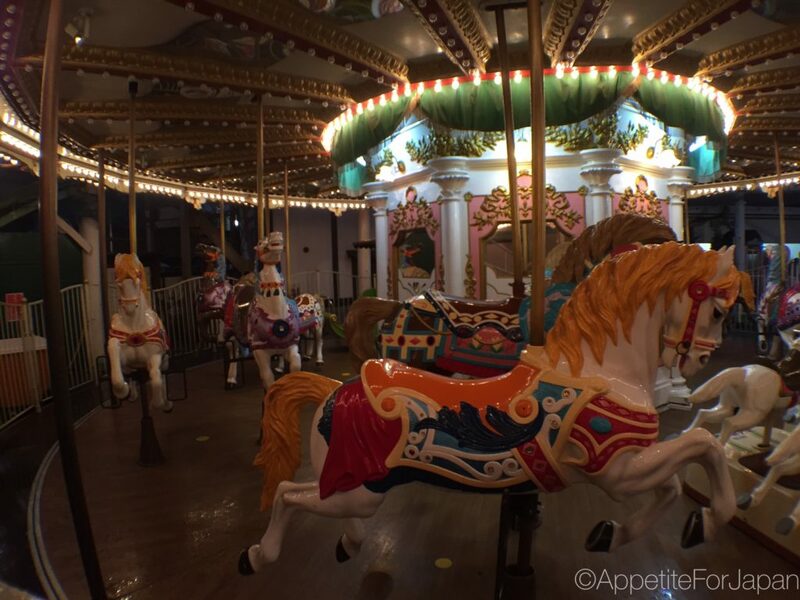 Above: More old-school amusement park games. 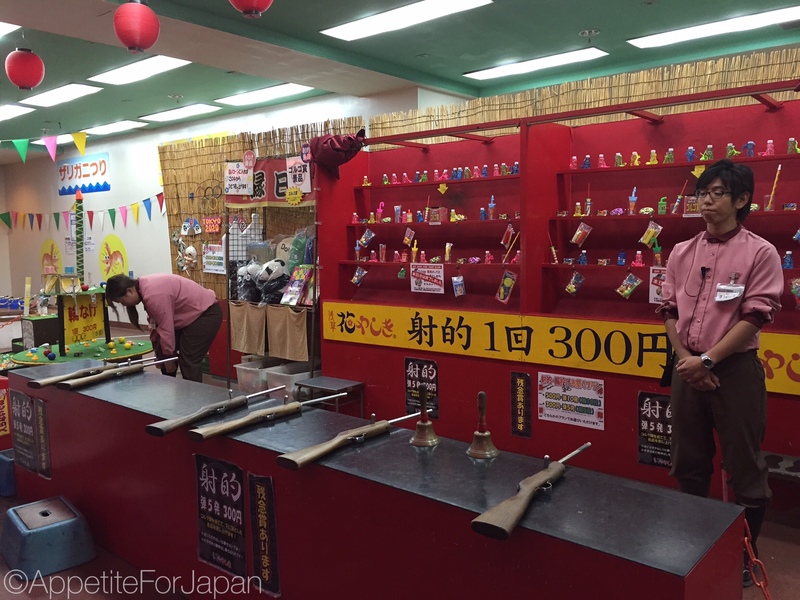 Above: Like most theme parks, there is a shooting gallery at Hanayashiki. These guns shoot little corks at the shelves in the back. 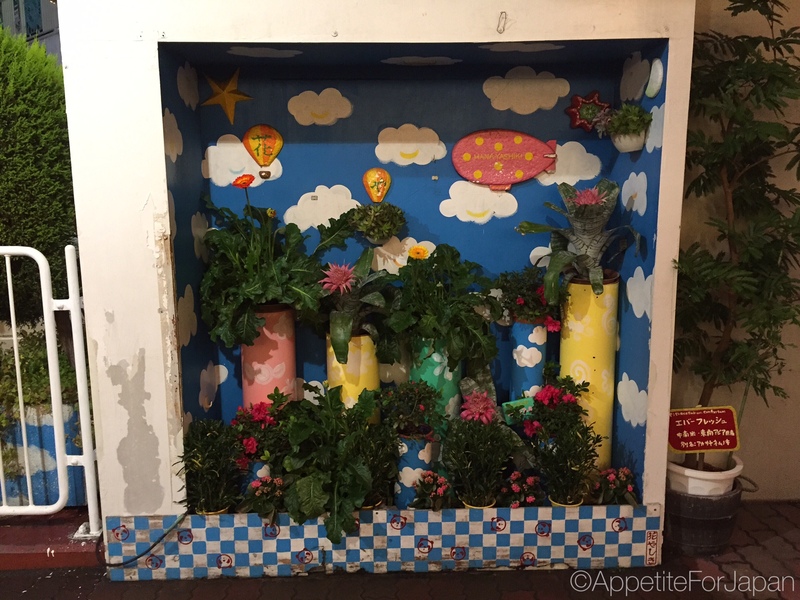 Above: If you’re successful at the shooting gallery, you’ll get a little prize. 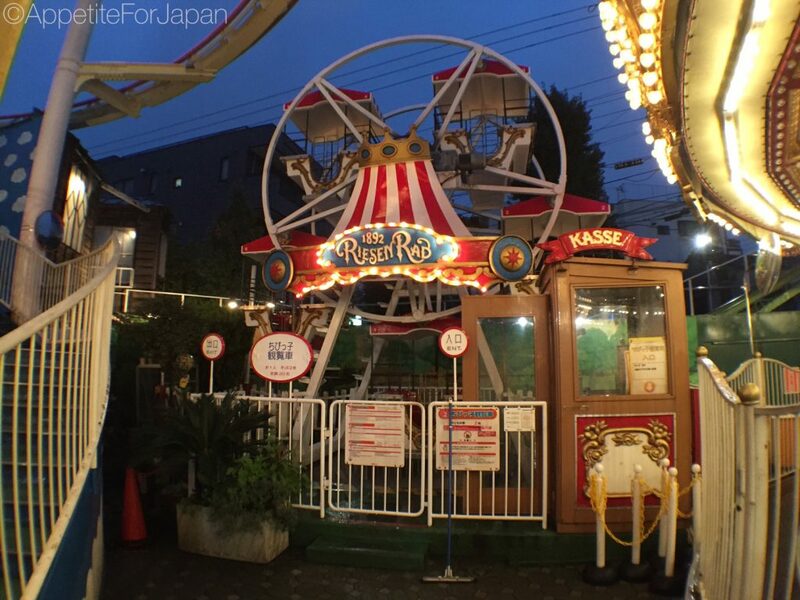 Above: If you’re not much of a people person, this three-person merry-go-round would be an ideal ride for you. I like to joke that it’s still two people too many! Above: The right poking up above the trees is called Bee Tower. You can’t see them in this photo, but the seats are inside little house shaped gondolas. 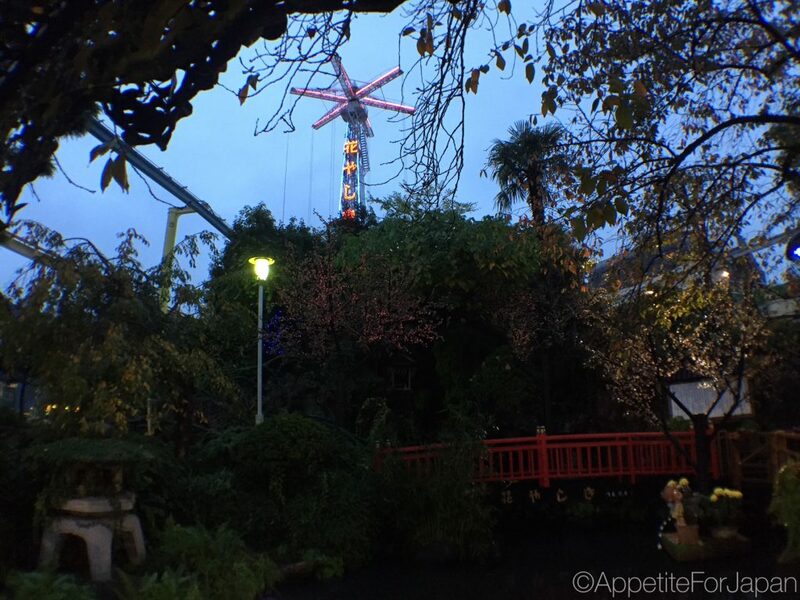 Above: There is a little red bridge over the pond, called the Bridge of Happiness. You can walk over the bridge, and up into the area above it (beware, though, when I tried this, I ended up racing back out when I saw all the mosquitoes in there!). 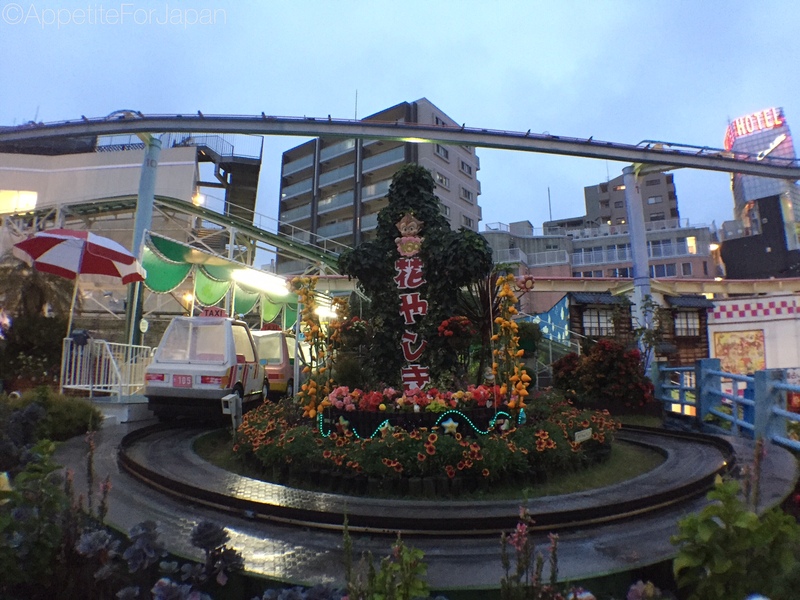 When Hanayashiki opened in 1853, it was a flower park. There are still many signs of its heritage around the park which is part of its charm. 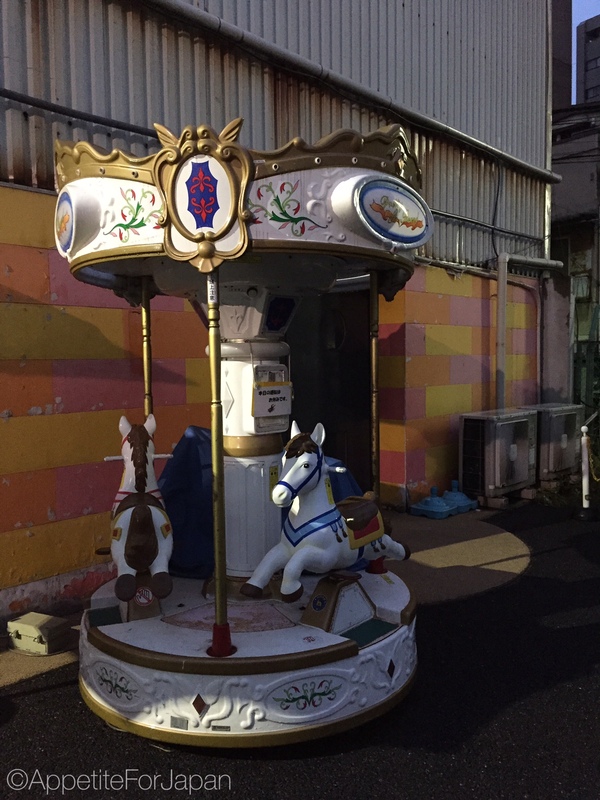 That, and the almost surreal feeling you get from walking around a small, kitschy, retro amusement park surrounded by high-rise buildings in the middle of modern-day Tokyo. 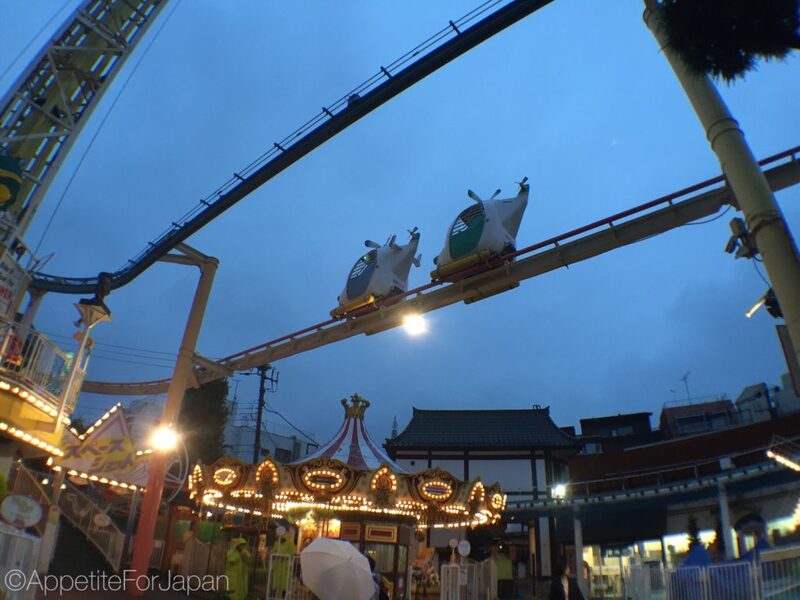 For the most part, the rides are quite tame compared to many modern theme parks. Then again, considering that some of them – such as one of the roller-coasters – were built in the 1950s, you’d want them to be fairly tame. Above: This is the main entrance to the park. 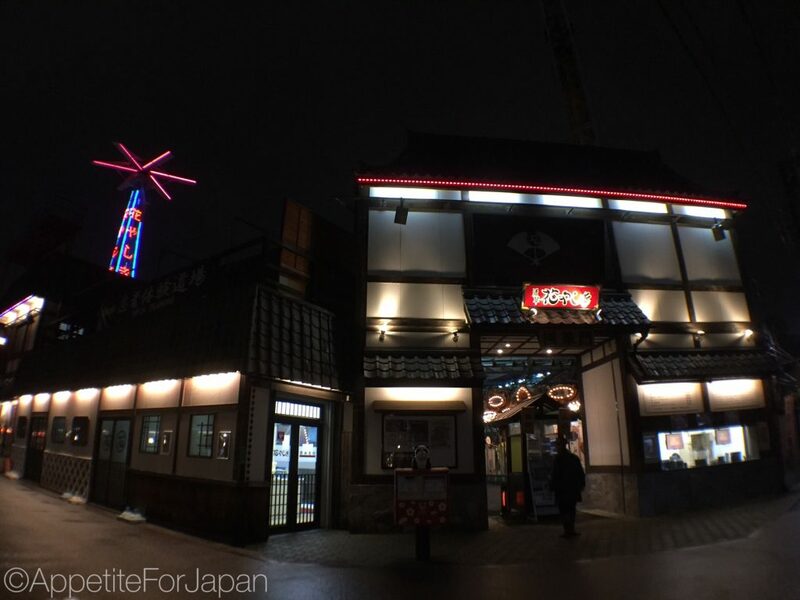 The building has that more traditional Japanese style, much like the little shops that run along the nearby streets of Asakusa. 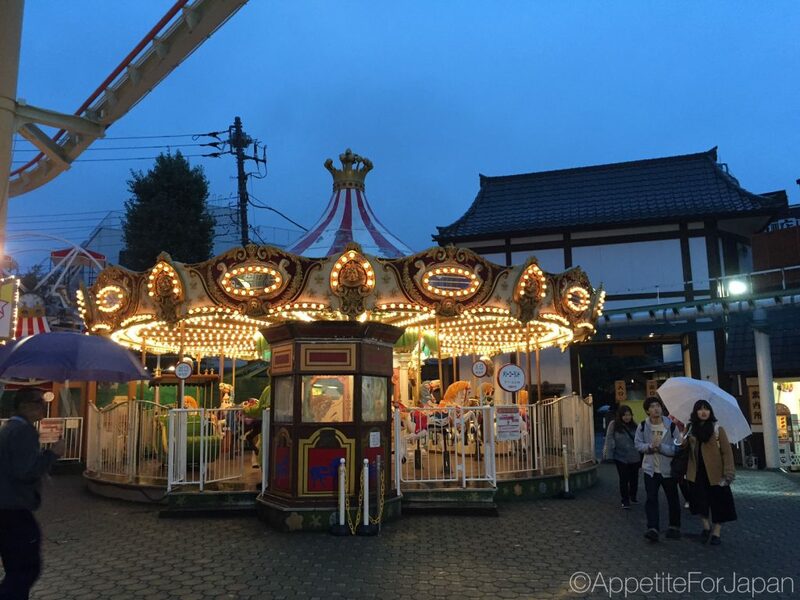 Would I recommend Asakusa Hanayashiki? 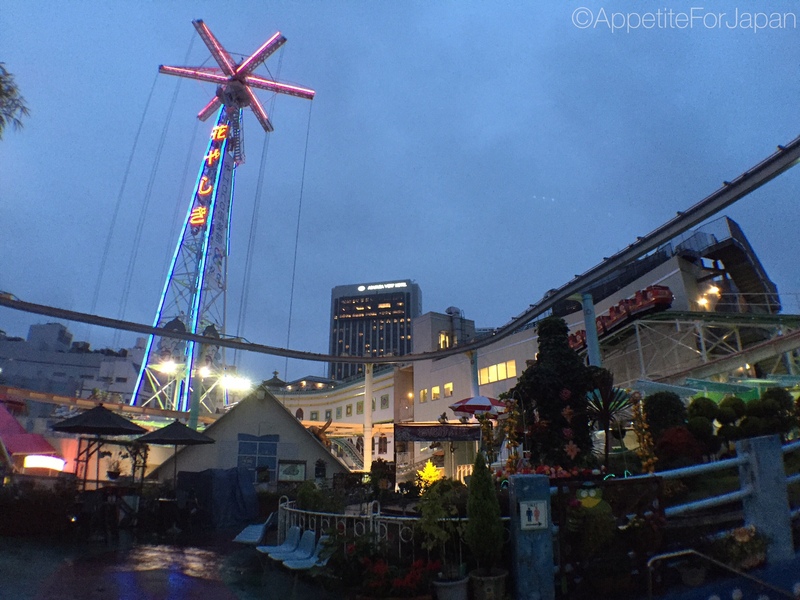 This amusement park is not so much for thrill-seekers or fans of big-budget modern theme parks as it is for people who are looking for something a little different. It’s quite unique, and the kitschy retro feel to it is kind of fun. I didn’t mind it, and I was surprised to find that my partner enjoyed it even more than I did. If you’re planning a trip to Asakusa Shrine and Sensō-ji Temple, and/or to see the Asahi Flame, then you should consider visiting Hanayashiki. 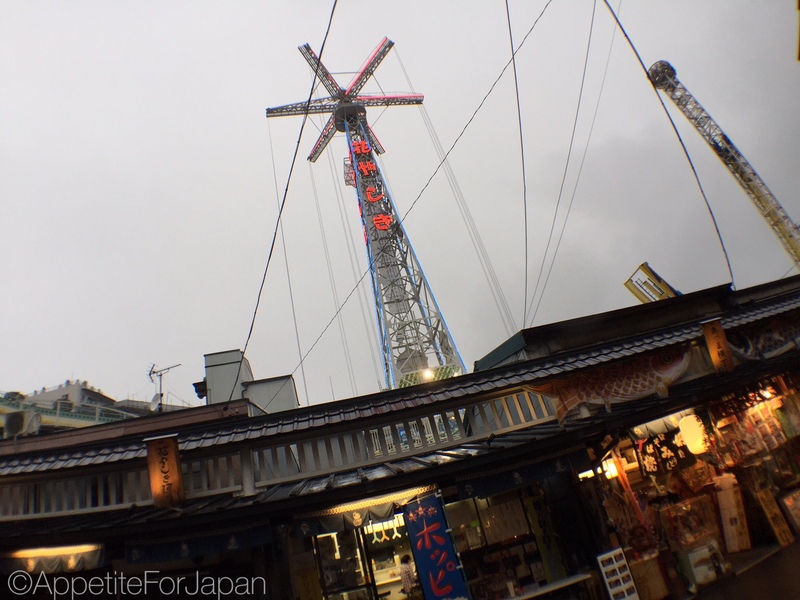 It’s just a couple of minutes’ walk from Asakusa Shrine, and unlike Tokyo Disneyland, you won’t need all day to visit. Note: Due to the stagnant water in the pond and many pot plants, there are a lot of mosquitoes at Hanayashiki, particularly around the pond area. I recommend dressing appropriately for this and/or wearing repellent. 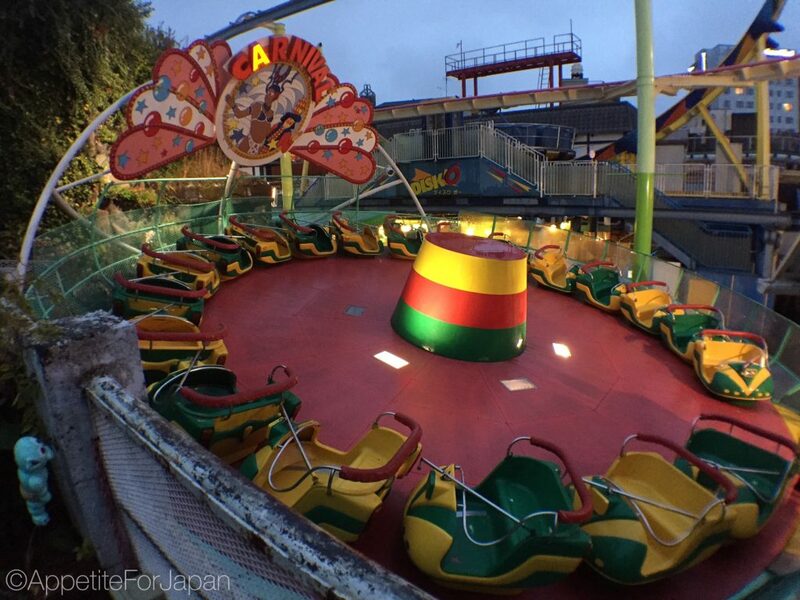 Last admission is 30 minutes prior to park closure. Note that the above covers admission to the park only; rides can either be paid for individually, or ride passes can be purchased upon entry to the park. 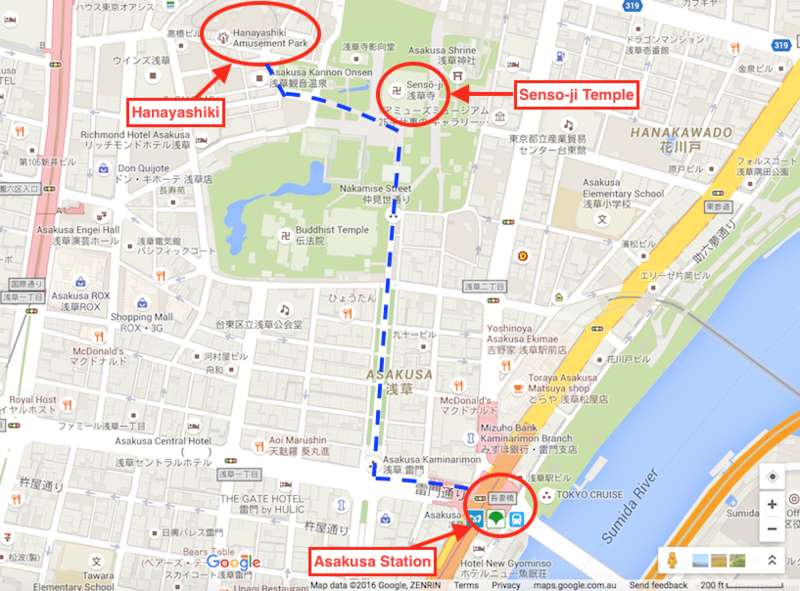 Here is a map that I’ve created (thanks to Google Maps) to show you how to get from Asakusa station to Hanayashiki Amusement Park. When you exit Asakusa Station, follow the blue dotted line. When you turn that first corner, you’ll enter Nakamise Street, which is a long street (for pedestrians only) lined with little shops aimed at tourists. You’ll know when you’ve entered Nakamise Street because it will be packed full of people including plenty of other tourists. Keep walking the whole way until you reach Sensō-ji Temple, and then turn left. Keep following the blue dotted line until you reach the entrance to Hanayashiki (see my photo above for reference, and also look up every so often to see the rides poking up above the other buildings). 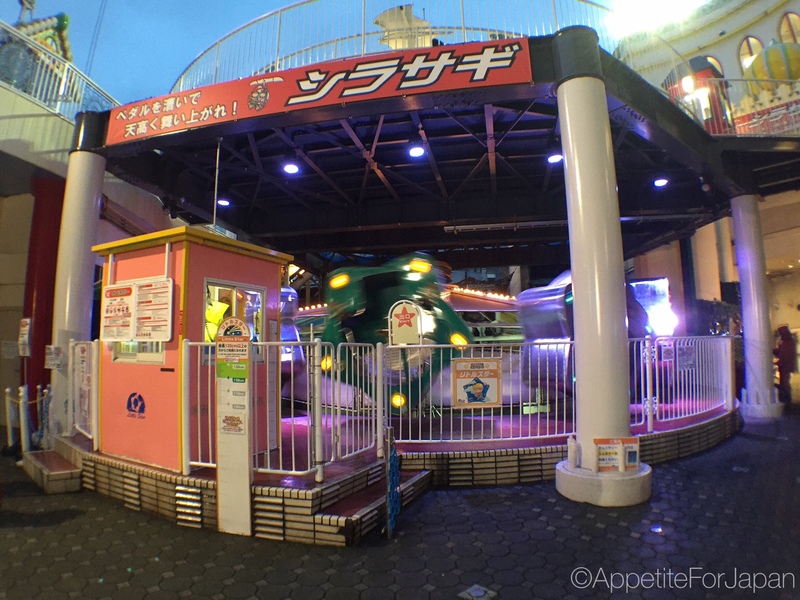 Having explored Japan’s oldest amusement part, it seems fitting that the next thing we’ll look at is the retro lollies and games at Decks Tokyo Beach in Odaiba.